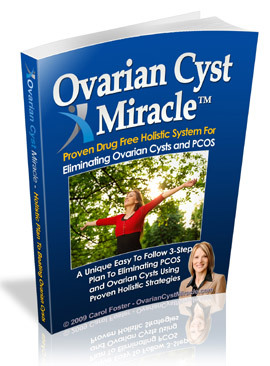 Get Rid of Polycystic Ovaries Without Drugs! The exact cause of polycystic ovaries still remains a mystery, but both genetic and environmental factors are shown to be causative factors of this disorder. Primary causes may be dysfunction of the ovaries, abnormal insulin activity, or problems with the hypothalamic-pituitary axis. Another important cause is obesity itself, and sometimes weight loss is enough to help regulate ovulation and control other symptoms. The polycystic ovaries have a thickened outer layer and about twice the area of normal ovaries. The increased area is due to both an increased stromal area as well as an increased number of follicles. Polycystic ovaries on ultrasound are characterized by 10 or more 2-8 mm follicles and an increased, echodense stromal area. This is generally associated with specific metabolic and endocrine abnormalities. Also, women with polycystic ovaries have associated risk factors for coronary artery disease. Polycystic ovaries may also be found in postmenopausal women. Often women with polycystic ovaries seen on ultrasonography often do not have the clinical symptoms of the polycystic ovarian disease. The disorder probably exists as a band ranging from no clinical symptoms to fully developed syndrome. Young women with polycystic ovaries often present with a gamut of signs and symptoms from acne, hirsutism, and menstrual irregularities to infertility issues. Pregnant women with polycystic ovaries too run the risk of early miscarriage, preeclampsia, caesarean section deliveries, gestational diabetes, and high blood pressure. Conventional treatment includes oral contraceptive pills, anti-androgens, ovulation stimulators, or ovarian drilling. Most of the drugs need to be taken over a long period of time and have many serious side effects. Since polycystic ovaries are often associated with cardiovascular risk, lifestyle modifications are highly indicated. A holistic medical practitioner will outline a personal program by taking into consideration physical, mental as well as emotional factors. This will help not only in controlling the symptoms but also reducing future risks.